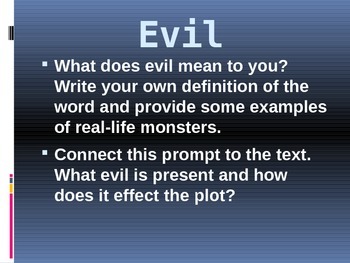 This PowerPoint presentation includes 6 slides with writing prompts to check for understanding. 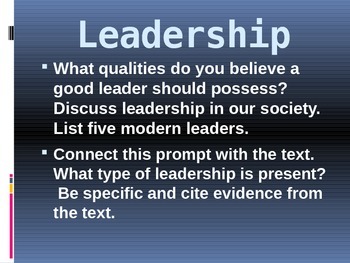 Each prompt is aligned to CCSS and requires knowledge based on using evidence from the text. I have other items that go with this text for sale including a Beowulf summative assessment, a Beowulf Snow Globe activity, and a Beowulf Casting Call activity. Created by TopGrump.